Books By Dr. Bail – Bernard W. Bail, M.D. Allow me to introduce you to my two books The Mother’s Signature: A Journal of Dreams and Irmgard’s Flute: A Memoir, which are about my life, the many challenges I have faced, hopefully the wisdom I have accrued through confronting these challenges, and the discoveries I have made as a result. All sciences strive to find the origin of the problem they’re investigating. We always turn to origins—it is in our nature. There is no doubt in my mind that with man’s very first breath he wondered about the origin of the world about him: the sun, moon, planets, oceans, mountains, trees, and meadows. The when, how, why. It is the “why” that most stirs the imagination toward the inner world, evoking daunting possibilities of forces greater than mankind, more daunting than some care to think. No sooner was psychoanalysis discovered than the thrust of exploration ran progressively toward origins. In a little while the child came into view as a proper vehicle for investigation and study. Analysts examined and thought about infancy, just as the physical scientists scraped away at the physical universe, picking and poking in the incessant endeavor to discover the where, when, how, and why. By now countless theories about mental functioning and personality development, and about childhood and infancy, have been set forth. Tools from many physical disciplines have been brought into the field of analysis, aiding us as we investigate the infant in all the physical and physiological ways possible. But, as analysts, we have to have faith in the tools of our profession. We must have the conviction of there being an unconscious and a conscious, and there being entities called dreams which can lead us to all the answers we want to know. If we pursue with purity the method of dream analysis discovered by Freud1, we find that the dream is the Rosetta stone of inner mental life—or so my experience has taught me. My experience has also taught me that all emotional illness is based upon the relationship between mother and infant, from the moment of conception—and even before the infant is conceived, for the mother already has a plan, albeit unconscious, that she will execute upon her future child. This is beyond the conscious fantasies she may harbor, the way all of us harbor dreams of the future. What the unsuspecting woman does not know is that the plan was already executed upon her. She has no choice other than to pass it on to her children. This process has such fixity that one may say it has a genetic quality. One can do nothing about it psychologically. Even so, I have found that analyzing even that which appears to be instinctual will yield to psychoanalytic exploration. Since all analysts begin learning their profession by dealing with the adult, there is often a reluctance and fear on the student’s part in dealing with children, unless one is doing a child analysis course. Specialization in this area requires additional years of training, and few analysts are willing to spend extra time in this area. I do not think specialization is necessary, however, for in view of my work I have come to the conclusion that there is no such entity as adult analysis. The adult part of the patient before us does not need analyzing. An adult can get dressed, drive a car, shop for food, do work, and so on. Wherever adult function is impaired, there infantile trauma has been. Pathological mechanisms rush to the wounded site the way leukocytes rush to a wound. Only we do not see the blood, the swelling, or the heat, for this process all takes place in the mind, which is so vast as to be capable of containing and even concealing much trauma and pathology. Of course, if the damage is too great, symptoms will emerge that the defense mechanisms no longer can contain. All emotional illness has its origin in infancy, and all illnesses can be traced to the infant’s relationship with first the mother and then the other members of the family. It follows then that there is no such thing as an adult analysis, for adult qualities and functions do not need analysis in the main. One is simply, and constantly, analyzing the infant in the adult— though there is no doubt that analyzing infantile expressions of pathology in the person will always improve adult functioning. To talk about these issues intellectually with the patient is of no use, for only when the infantile core, which is the emotional core, is available can something be done through interpretations. As a matter of survival, all infants have to ensure that their mothers will live. It has become clearer and clearer to me that babies’ minds have to split almost at birth, maybe even before, in order to accommodate a mother who is beset by emotional disturbances—and, of course, who among us is not beset by emotional disturbances. To ensure the survival of the mother, the infant has to become his or her mother. Then the infant knows that he or she will live. All of this is unconscious in the baby’s mind, and though the infant feels that a big problem has been solved, which it has not been, the infant will indeed live. The consequences that follow will trail the infant all the rest of its life, for he or she will have a life-long identification of being the mother. The mind will be split, and the entity the baby was supposed to be will never come into existence. If there is not too much damage in early infantile life, one can live out one’s life relatively well or less well, depending on the vicissitudes given one. However, when the damage is too great, the infant is forced to give up its own pristine potential self in order to survive. The task of analysis is for us to reach that well-defended and often hidden part and begin to set it free. This is not easily done. The patient will resist the analysis in a myriad of ways. And the sicker the patient is—that is, the greater the split—the greater the identification with the mother will be. It is sometimes so great that the patient is, for all practical purposes, the mother, and there is no patient. Some ten to fifteen years ago I was analyzing a young woman who was very constricted, a constriction that covered a very infantile personality, all of which was hidden by an organized, professional stance. Professions hide much, as we all know. This woman delivered a baby in the course of her analysis, and it was a terrifying experience for her. So much so that she returned to the analysis within one week, driven by her anxiety. She walked into my office with a tiny baby in her arms. She sat on the couch, holding the baby awkwardly and away from her body. It looked as if she were holding something dangerous, something she needed to rid herself of immediately. The baby cried loudly, incessantly. I felt like getting up and taking the baby myself, but I did not. The patient began telling me her dream amid the squalling noises of the infant, who was lying now with her back arched. I listened to the material, trying to concentrate on the patient’s words. When I felt I understood the dream in relation to the patient’s associations, I made an interpretation. The dream and interpretation are as follows. I said to this woman, as she held her week-old infant in her hands, that what she didn’t know how to do was to be a mother; and I asked her to look at how she was holding her child, almost at arm’s length. On hearing my comments, she folded the baby into the crook of her arm. To my surprise, as soon as I spoke, the baby quieted down and fell asleep. I watched as the baby relaxed and fell into a deep sleep. Her face lost its redness and became pink. Then the patient relaxed and leaned against the wall. This happened regularly for the next six months, without fail. Every interpretation quieted the baby and when she relaxed the mother did as well. That was the beginning of my understanding that talking to the mother was talking to the baby. There seemed to be no barrier between the two. It was a matter of two hearts in consonance, but with one mind, the mother’s. Later, other young women analysands brought their babies, often for lack of a babysitter, and the same thing would occur. Even with older children, interpretations made to the mother always affected and quieted the child. You see, I was to discover that the baby has been imprinted with the mother, imprinted in the way it is to live and to die. We are all imprinted in these early moments and hours of life. Konrad Lorenz found this to be true of birds and other species, and I say it is true of humankind as well. The principle is the same. It is simply the law of economy at work. We hide our imprinting by our brains, by our intelligence, but a deep analysis uncovers surely and slowly beyond our technical knowledge and our cleverness the simple fact of our being imprinted. All things in the world, all creatures, have their signature. What is DNA except an imprinting device—so simple, but capable of great diversity? The fact that we are imprinted is not to be scorned or rejected or fought against. It is the nature of being, and we take our place in the universe as one of the creatures with the greatest potentiality for evolution—that is, if we can get past an imprinting that leaves us crippled, passive, frustrated, and bent on self-destruction. Now it is clear that every person’s problem in life is not the Oedipal struggle. The problem is in how to find the spark of the self that one was supposed to be as one came into existence, and the central issue is how to become oneself, and break free of the mother’s imprint. It is over this issue that the patient puts up the greatest struggle. Confronting this fundamental conflict is the most frightening task for the patient and for every human being. Cure can only come about when there is a transformation. The patient has to repudiate all the emotional connections that are attached to the maternal imprint2not by saying “I let you go,” but by living an emotional letting go, which may take a very long time. It is only through a renunciation of the false self that a true transformation ensues. Short of this, if the choice is made by the patient not to sail on this journey, a fundamental change, a true transformation, will not be made. Only when there is evidence in dreams that the patient is fighting for himself, only when that tiny hidden spark slowly reveals itself, can we be sure of there being a transformation and a cure. When a genius speaks I have always taken it seriously. I listen with devotion and awe, for these people are imbued with a touch of what I must call the “divine”—in the way we regard the great composers, scientists, artists who have had that incomparable vision. I think Thomas Carlyle, the Scottish historian, was on the mark when he wrote that civilization is the history of those few geniuses whose discoveries have enlightened mankind, pushing back the powerful envelope of darkness that constantly threatens to enclose us. Momentous discoveries have not only brought illumination to mankind, they have given us hope; they have brought hope of there being a unity in all phenomena, animate and inanimate, contained in the world and in the universe. When Freud stated he was the most fortunate of men to be given the secret to the interpretation of dreams, he was absolutely right. He was given this opportunity and his genius seized it, for he knew, beyond all doubt, that it held the key to much of humankind. My work posits that dreams hold possibilities that not even Freud wrote of (though we cannot say what he might have thought or suspected). I understand dreams are out of fashion, which is paradoxical, for they represent messages from the unconscious, and analysis is the one discipline out of all the scientific disciplines that knows how to broach this leviathan. Without dreams and their understanding there can be no analysis, and we are flung back a hundred years to the darkness from which Freud rescued us with his greatest work, The Interpretation of Dreams. The unconscious may contain many things that we so far do not know about. But one thing it does contain without a doubt is the record of one’s life from the origins of that life—indeed, even to the formation of that life, egg and sperm. If one listens properly, these origins can all be recovered. When a patient tells us a dream, he is tugging at our sleeve, begging us to hear him out—to understand his infantile fears and trauma, the imprint that clouds and conceals his pristine self. In that room and on that couch he is saying he wants to be aware of his life, to become open to the secrets of his unconscious. He comes to analysis because he suffers. He comes because he does not want anymore to react to his life. He wants to be in his life. When he opens up the treasure of his unconscious, he will become greater than what he thought he was before, back when he was indrawn, constricted, and wearing all the masks that life has fashioned for us. Masks that cost us our truthfulness, our simplicity, our essential selves. The work of listening to dreams is very difficult, for every dream carries with it a charge of toxins that makes us weary. It is not easy to bear the confusion, the disjoint of the communication—that is, it is not easy to bear the transference and the hatred that come with this job. The participants also must have great endurance, and the truth will prevail only if the patient allows it to, for the patient always has a choice about how he wishes to live his life. The reward for the patient is immeasurable: freedom in letting go of the toxic material that has been lying in his mind, slowly paralyzing him out of his own life. It is this relief that gives the patient the impetus to go deeper, to trust more, to become as a child again and take the hand of the guide. Here all the strength, the skill and the experience the analyst can muster are important to hew to the truth of the dream, for the truth will be contained within it. It is all an analyst can do. It is the best an analyst can do. 1. Freud’s method of analyzing dreams (his use of the day residue, his attempts to gather detailed associations to the elements of the dream, etc.) is to be distinguished from Freud’s wish fulfillment theory regarding the latent content of each dream. If we follow Freud’s method, without an a priori theoretical conclusion regarding the dream’s meaning, then we see that the dream illuminates a life in its entirety, revealing the truth of that individual’s being, and more. 2. 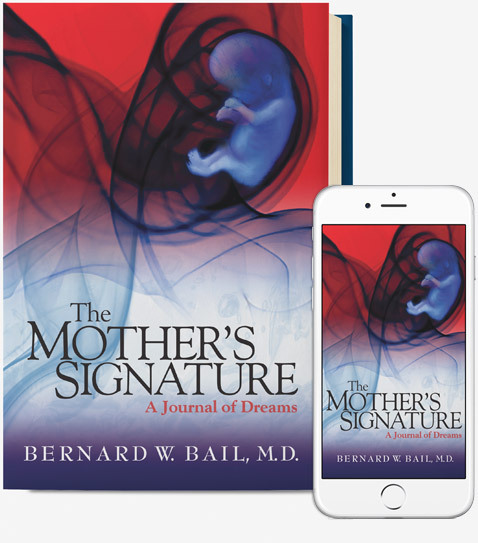 The maternal imprint consists of unconscious, unbearably painful feelings and experiences within the mother, that cannot be held within her mind and are thus projected into her infant’s nascent being. The infant, without a defensive structure, must then take care of its mother’s unconscious—hold that unconscious within the infant’s mind—and in this way become the receptacle for what is unaddressed, unknown, and unwanted within her. The infant thus becomes the mother and cannot come into its own unique existence. Shortly after a touching romantic encounter with the beautiful and earthy Giselle in liberated Paris, 1945, American Lieutenant Bernard Bail was shot down on his twenty-fifth flying mission over Germany while navigating a squadron of B-24 bombers over their target. Seriously wounded and taken as a prisoner of war, Lt. Bail is brought to a hospital where during his recovery the impossible happens: he and a young German nurse fall in love. Irmgard awakens Lt. Bail’s spirit and opens his eyes to his inner world. I never slept after learning I would fly the next day. Those of us who were chosen usually turned in early. Wake-up call might be at two in the morning or even earlier, depending on the target, and on those nights I’d turn my face to the wall and close my eyes, trying to block out any ill thoughts or omens. In the best of times I would doze off, but usually I just lay there stiffly, waiting for the orderly to come in and tap me awake. “Time, Lieutenant,” he would whisper, so as not to wake the others. None of us slept well when we knew we had to fly the next day. At least when we did get called up we had the great relief of fighting from the air, of not being foot soldiers on the front lines, the way my brother was. I knew that was one place I did not want to be: on the ground. For me, the level playing field was the sky, and my weapon was the radar. Crossing the North Sea, I could see a hundred miles as the beams swept the terrain and marked out the cities. We had flown these skies frequently, so we were already familiar with the cities as they came onto the scope. As navigator, using the radar I could correct the pilot as we followed the routes mapped out before each mission. When flying lead or flying wing to the lead my attention was constantly riveted on that scope, for every other plane in the formation depended on the lead plane; the moment it dropped its bombs, all other planes would trip their bombs as well. I never got to use my sextant to take readings of the stars, though I had trained with it endlessly in navigation school. Nighttime flying as a cadet had been thrilling, encompassing the great romance of being at one with the stars—the beauty of looking down on the clusters of light, the patterns of the cities surrounded by darkness, and the Big Dipper, which led us by the tail to the North Star. From the cockpit there were only countless numbers of stars on every side of you. Back then, I had felt an enormous pride gazing out at that sky, feeling I was part of a great adventure, one that would hurl me out of my small Jewish world in South Philadelphia where I was born and raised, and into the heavens. It was the different life I had imagined, back when we wore sweaters at night, back when my brother and I scoured around the stores on Seventh Street—the delicatessen, egg store, or hardware store—for wood or cardboard boxes. It was a richer, more colorful life of heroism and adventure, or so I had thought. But diaries of flyers are seldom exciting, and fighting a war is often monotonous: a lot of waiting, a lot of small talk, sometimes a lot of drinking and womanizing, bridge or poker at the officer’s club, or hanging out in town with a girlfriend, waiting for a buddy to call and say, “We’re flying tomorrow, come on.” Other than that, we had far too many hours with nothing to do but count the missions we had flown and torment ourselves with thoughts about the ones we still had to fly. The worst time was when you got into the twenties— when you had flown that many missions—for then everyone began to sweat it out, hoping for milk runs, the easy missions with light flak not too far inside Europe. For, according to our calculations, a flyer was not supposed to make it past the twenties. But no one could tell; any day we might be sent to the Ruhr or to Berlin, with its six hundred guns—.88s, those enormous guns that could find us at thirty-five thousand feet, and wound or kill us. You just tried not to think about it. On March 19, 1945, I was awakened early, and silently put on my flight jacket, green officer’s pants and high government-issue boots. It seemed a normal day. As usual, I packed a toothbrush in my pocket. I piled some wood chips in the little space heater—we took turns doing this—and left the cold Quonset hut. Then, down to the mess hall, by now crowded with fellow officers. There were something like six hundred men packed into the hall, and the atmosphere was noisy and boisterous. We had enough time to order anything we wanted. Those flying had the best food available in the world, and I ordered my favorite, a stack of pancakes with eggs over easy in between each pancake, muffins, a glass of milk—powdered, of course—and coffee, then sat at one of the long, cafeteria-like tables with a group of men I had flown with in previous missions. A kind of nervous anticipation permeated the room, and no matter what we talked about—the mission, what we had done the night before—the talk was slightly hollow, as if each man was already withdrawing into himself, preparing for war. After breakfast we walked to the war room, where the mood shifted to one far more sober. No one spoke now. We took our seats and waited, staring at the covered board until the colonel walked in with his staff. And then the mission was unveiled—a line drawn across the Channel in red string to the target: the point of departure, the flight path, which included the turns we would make to the I.P. (Intercept Point)—the point at which the formation would turn to the target itself, usually a distance of some twenty-five to thirty-five miles. We were also told at what intervals, and in what angles and positions and altitudes we would peel off, since we always flew in formation. Everything had to be done in synchrony. Every man listened to the colonel intently, knowing his life depended on it. This mission was deep in Germany—Ingolstadt. The colonel briefed us on the target and its importance: German jet fighters were made in Ingolstadt, so the goal of this mission was to destroy the factories and prevent these German fighter planes from coming up against our slower fighter aircraft. The colonel described the Nazi antiaircraft guns and the fighter aircraft we would most likely encounter, and he talked about our own support fighters who would not be able to accompany us all the way there and back. Earlier in the war our support fighters were not able to follow us very deep into Europe, but by this point American ingenuity had found a way to mount auxiliary gas tanks on them, allowing them to fly deeper into the Continent—though not as far east as Ingolstadt. We loved these “little friends”; when a target was near they would stay out of range of any flak coming from the ground, and circle around, waiting to shepherd us home. We left the war room, picked up our parachutes, and made our way to the jeeps lined up outside. My parachute was usually a chest pack that I clipped on, and this day I received it with a good luck, Lieutenant, let’s hope you don’t have to use it. The jeep dropped me off at my plane, where the crew was gathering, and I met the two pilots; this was my first mission with them. Very young, I thought, and began to feel uneasy. I understood that they were being groomed to fly lead, so in this mission we flew in number two position, to the right of the lead plane. As we entered the plane and prepared for takeoff, my misgivings grew. The young men crackled with the enthusiasm of the uninitiated, and their bonhomie with each other only annoyed me, but I could not show this. I did my job, and spoke when it was necessary to do so. I knew I could not let my feelings of increasing dread affect the others. My other lead crew members would have noticed immediately that something was wrong. I remained calm as I met the chief engineer, the navigator, the bombardier, and the radio operator. I did not meet the waist gunners or the tail gunner. In due time we strapped ourselves into our seats, the engines warmed up, and the plane trundled into position. I had never experienced this feeling of alarm with any other lead crew, even at the Ruhr with its six hundred guns. Germany protected the industrial Ruhr very well, and no one felt good about flying into that valley of death. As we took off I readied my equipment and maps and checked out my oxygen line. I made sure that I had at least two flak suits— one on my seat and one around my shoulders to deflect anything coming in from the left side, since my seat was behind the pilots and the navigator was to my right, across the aisle. There was nothing else I could do. Mounting an airborne attack was no easy task. Gathering into formation took about two hours, and as the huge birds circled I pored over maps, memorizing landmarks, trying to keep my mind focused. We were going to enter Germany from the north and fly south. I recognized many of the names on the map from prior missions, having flown to Bielefeld, Braunschweig, Schweinfurt, Kassel, Regensburg, and so on. These names were familiar to all of us flyers, especially Magdeburg, where we had gone three days in a row. There was nothing left of the city, and today I do not even know why we leveled it; nor do I know why we went to Dresden unless it had been a last-minute alternative target. We swept that city, and it was a very, very long mission. I think we all tried to keep the people out of our minds, those who were victims of it all. We were crossing the North Sea when the pilot gave the gunners permission to fire their guns, and we could hear the clatter coming from behind. It was something they enjoyed doing, a necessary job because they had to make sure the guns were working in case they had to use them. It was something to do. I was lucky, for I had a great deal to do, making sure the lead plane was on course in accordance with the lines drawn on the map in the war room. I concentrated on my job, and willed the mission to go smoothly. I did not feel any more at ease as time went on. I rarely spoke to any member of the crew, except when the pilot would ask, from time to time, where we were. I would say something like, “Now we are here, three hundred miles from the target and on course.” There was nothing to do but wait. The gunners scanned the skies, and our “little friends” swept on ahead, to our flanks and above us, to ensure there would be no sudden attacks, especially from the dreaded new German jet fighters. American engineering was behind here, as we were in rocketry, at which the Germans excelled. 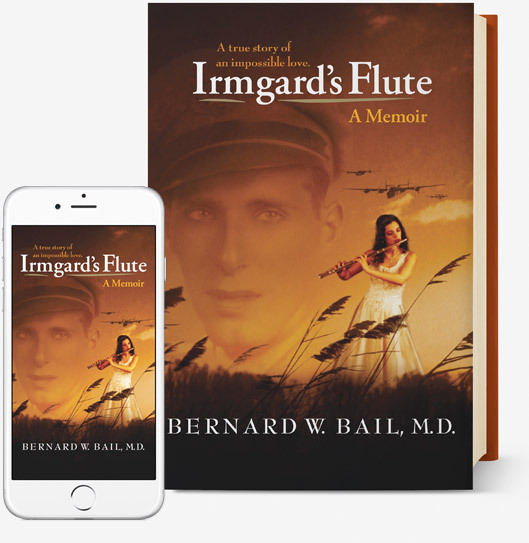 "2007 Honorable Mention for Irmgard’s Flute"
Have you gotten your copy of Bernard W. Bail, M.D.’s books?